Having to be physically tethered to a PC to use the Oculus Rift or HTC Vive hasn't really hurt either company, though certainly we're all looking forward to a time when one or both headsets go wireless. Maybe that will happen this year or next. In the meantime, third-party companies are stepping up with wireless accessories so that first-generation headset owners can walk without wires, too. The latest to join the fray is Sixa with its Rivvr wireless VR upgrade kit that is available to pre-order. 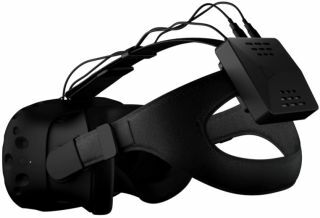 Unlike the TPCast that is being developed at HTC for use with its Vive headset, the Rivvr is compatible with "all modern VR headsets," including both the Rift and Vive. It's also different from today's backpack solutions in that there's no bulky hardware to lug around. The Rivvr transmits movements over a 2.4GHz or 5GHz Wi-Fi connection. Sixa says on the Rivvr's product page that latency is "imperceptible," though during an interview with TomsHardware, Sixa co-founder and CEO Mykola Minchenko said the current version adds 11ms to the equation. He expects that number to go down to 6ms when the retail kit ships. We haven't tried the Rivvr accessory ourselves, though a video showing the wireless kit in action seems to indicate that latency is not a issue. Sixa also says the Rivvr is lightweight and easy to mount. Since it uses Wi-Fi, the range is limited by the user's home network. Looking ahead, Sixa is working towards removing the PC altogether from VR with a streaming-based solution that would use just the headset, Rivvr, and Wi-Fi. For now, however, Sixa will push its Rivvr accessory. Sixa is now accepting a limited number of Rivvr reservations that requires a $60 down payment. The full cost is $209 for the head-mounted version, or $199 for one that clips to a belt. Battery life is good for up to 3 hours on a single charge, though you can double that by upgrading the battery for $50. You can place a reservation here.